Portable Video Magnifiers are powered and charged in a similar way to a mobile phone as they contain rechargeable batteries. This gives you the freedom to take the video magnifier with you in the same way as a lens magnifier. A larger screen may be more appropriate if you are attending meetings or need to read larger bodies of text. All the video magnifiers including the 7″ and 10″ magnifiers have variable levels of magnification to help you see even the smallest text. They also have enhanced colour options and natural colour mode. Battery life will vary but should give over three hours use if fully charged. 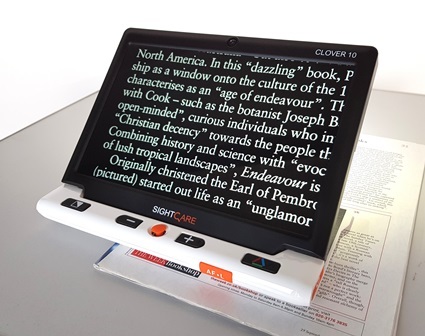 The flexible solution for reading, writing or viewing at any distance. By simply rotating the camera you can magnify images in the distance. Use it to view paperwork or presentations, or work on crafts and hobbies. Clear full colour image for viewing photographs, food packaging and doing crosswords or puzzles. Its small footprint and lightweight design allows a degree of portability.